I just got back from an amazing #AEJMC15 conference in San Francisco. 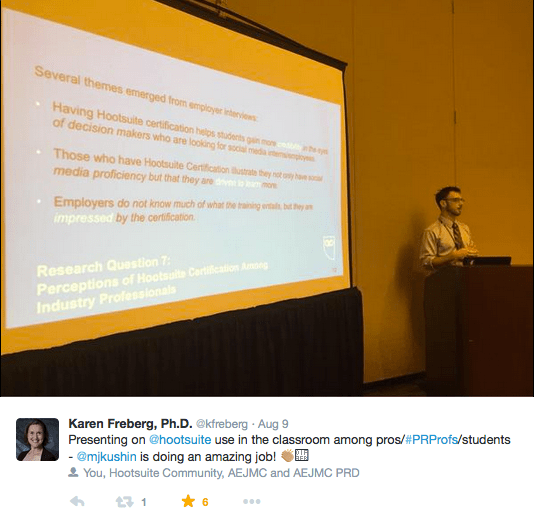 There, my colleagues and I had the pleasure of presenting our study, “Hootsuite University: Equipping Academics and Future PR Professionals for Social Media Success,” as the top paper in teaching pedagogy in the Public Relations Division. I had the pleasure of working with some truly awesome social media professors! This was such a rewarding experience because this is such an important area of research. We expect our students to excel in a workplace that is evolving alongside lightning-fast changes to our media environment. But for them to succeed, it is vital that both educators and professionals in the social media space continue to explore what an education in social media entails. There are big challenges ahead for all of us in the social media space. And there are lots of questions. My colleagues and I have explored social media education certification programs as one avenue for helping students get the training they need to excel as professional communicators in a social media world. And this is an area that shows a great deal of potential that warrants further exploration and discussion. But many people aren’t familiar with social media certification programs and not enough is known about how to effectively use them. How can these programs benefit social media educators? To what extent do social media certification programs help students prepare for careers as communication professionals? How do employers perceive social media certification programs? Are they valuable? Why? Educators, students, and business professionals have a vested interest in exploring the potential benefits of social media education certification programs and how these programs can be best utilized. Hootsuite University is a social media certification program aimed at preparing professionals for expertise in the Hootsuite social media dashboard software. It also enables individuals to demonstrate proficiency in professional social media use. To continue the conversation on how social media certification may benefit social media education, my colleagues (Emily Kinsky, Karen Freberg, and Carolyn Mae Kim) and I have put together a panel proposal for 2016 SXSWedu titled: “Incorporating Social Media Certification In Class.” Panels are accepted based on popular vote. The panel will explore Hootsuite University and how professors can work with students to sharpen digital skills in today’s rapidly changing media environment. We aim to provide insights from our research as well as share key skills, tips, and takeaways from our own experiences for enhancing social media savvy among employees and students. There’s no doubting that social media education is a vital area of skill and understanding for today and tomorrow’s communication professionals. And social media certification programs may help fill that role. Presenting this panel at SXSWedu, such an important venue for the intersection of technology and education, would allow us to reach a wider audience, sharing best practices for using social media certification programs like Hootsuite in the classroom to enhance social media education. To help us accomplish this mission, please support us by voting for our panel. I’d love to hear your thoughts on or experiences with social media certification programs, or how we can continue to grow and adapt as a field to ensure students today are being prepared to excel in the social space. Thank you so much for all of the support I’ve gotten as I work in this space. It means a great deal to me. And thank you for voting for our panel and for sharing this article! Post originally published on LinkedIn.